One of the key objectives for most students joining the program is to enhance their English skills. The program offers a wide range of facilities in this regard. These facilities answer not only the needs of students starting the program with specific weaknesses but also the ambitions of students aspiring to achieve fluency at a professional level by the end of the program. The following is an outline. This is a lecture course with one lecture a week during each of the 4 terms. The level of the course is pitched at intermediate to higher level so that any student admitted into the program can attend. write about legal matters in different ways such as email, letters, and notes/memos. The topics covered are the areas of law most likely to be encountered in international business situations and include contract law, tort law (civil wrongs), company law, commercial law, litigation and arbitration, international law, and comparative law. In order to talk about legal matters, it is not sufficient merely to know the correct legal terms and so the course covers language for discussing, comparing, suggesting, etc. This functional language will be useful for other business and social situations. Students are encouraged to consider the lectures as an opportunity to practice expressing their opinions in new ways and not to be afraid of making mistakes. This is a popular course for students in their first year of the program. The Advanced Legal English course also runs at one lecture a week over the full academic year. Students must have a higher level of English to be able to join the course. A significant amount of independent study is required outside the class with class times primarily used for review, analysis and further practice. The course is aimed at students wishing to achieve a professional level of legal English ability for business purposes. It focuses primarily on reading and writing legal texts in a broad range of situations likely to be encountered in international law firms or the legal departments of international businesses or supranational institutions. It covers both technical legal vocabulary and the formal style of English used in the conclusion of business transactions and institutional proceedings. Kobe University is a test center for the TOLES legal English certificate, and students have the option to take the TOLES exams at various times. As of March 2018 Kobe University is the only test center for international legal English certification in Japan. TOLES means “Test of Legal English Skills” and is operated by an English organization that is a member of the International Division of the Law Society of England & Wales. The TOLES certification program consists of three levels of professional exams. The exam levels are progressive steps towards reaching the standard of legal English required by employers such as international commercial law firms, in-house legal teams in private companies, and top-class translators. The TOLES advanced level certificate has significant international recognition. More information can be found at http://www.toleslegal.com/. We recognize that each student has different needs and so additional support is provided on a more personalized basis. One native English-speaking professor is specifically allocated to respond to these needs and give time to students on an individual basis. Support is given to both written and oral stages of mooting by a combination of native and non-native English-speaking staff. There are in addition other English language courses and facilities outside the Graduate School of Law that students are able to access. 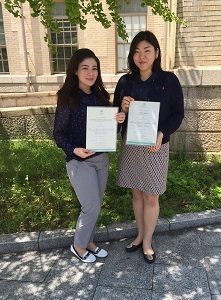 Viviane Soares de Azevedo and Miho Sakai became the first students to take the TOLES international legal English examination at Kobe University, with both students passing the Higher Level examination (Ms. Soares de Azevedo passing with distinction). 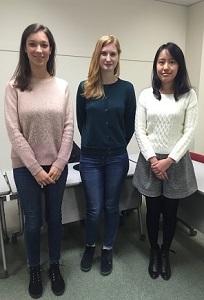 Debora Simoes, Maria Byvakina & Hikari Saito are recent successful candidates of the TOLES Higher Level legal English examination. Copyright © 2015-2019 Kobe University. All Rights Reserved.